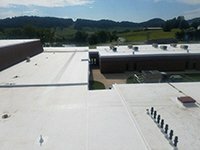 Medford Roofing understands that business must continue as usual when your commercial building roof needs to be replaced. By working quickly, after hours, and weekends, we ensure minimal or no impact on your daily operations. Additionally, Medford Roofing is fully committed to maintaining a safe work environment. Because of our vast experience working with building owners, property managers and general contractors, we are able to meet logistical difficulties, as well as, individual requirements.